One of the things I have developed a taste for is top quality sound. I have always been passionate about quality, and audio electronics has long time been a hobby. Years ago, I even ended up working designing custom professional sound gear for bands, cinemas, bars, places of worship and much more. 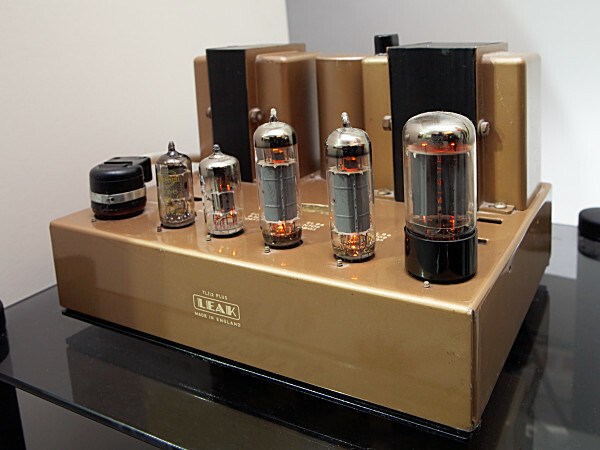 Some years back a friend persuaded me to buy a pair of 1950's Leak TL12 monoblock amps which where in need of some attention - they where a bargain. Sadly these are not the original legendary "Point One" version (rare), but the second version of the TL12 (AKA "TL12 Plus") with the electrolytic caps. Once restored, the sound was was superb. Sightly thin on the low end compared to the ferocious solid state amp I was using at the time, but extraordinary prescience and detail in the mids, and clear smooth highs. The TL12 is not like modern component amps. It probably wasn't even intended for the domestic environment. My understanding was that it was designed for installation in studios of the day, and Leak supplied the BBC for their studios. They deliver a mere 12W (RMS) of output power. With the grossly inflated ratings that everyone is accustomed to now this seems completely impractical. Some simple maths: a decent quality speaker will often deliver about 89dB per W at 1m - and the room will keep that up further away. Two of those and you got 92dB - that's already much louder than many people would be comfortable with in a domestic environment, and then there is 12 times that power still on tap, and unlike todays equipment, the rating of 12 real Watts is a conservative rating - they actually go beyond their rating. Not an amp for anyone wanting to annoy the neighbourhood, but plenty enough to enjoy good music. These where some of the finest amps available and built for the highest quality. Think of them as understated fine craftsmanship rather then technology for technology's sake. They easily outclass any modern consumer system, and will give many high-end amps a good run for their money too. Over time I ditched the solid state amps and have ended up with the TL12's as my only amplification. I run a combination of a turntable (with an exotic passive preamp that I designed myself) and a Squeezebox through a "passive pre" into the TL12's. Simplicity at it's best. And..... they glow in the dark! Many people think of valves as unreliable. In some ways they are: there are many poor quality valves around, they are fragile and don't take well to rough physical treatment. On the other hand, valves will often take electrical abuse in their stride where a solid state amp will suffer almost immediate catastrophic failure unless it has protection designed in. Valves last several years, transistors (and other solid state devices) last much longer.... but really does the whole system? The individual components may last longer, but how many people still have an original iPod that works? How long is your current stereo going to last? How long before you replace your car? Look around you. How much of this modern electronics will still be serviceable and working in 50 or 60 years? If you can lay your hands on the basic chassis with transformers for a TL12, assuming that nobody has attempted to destroy it completely everything you need to bring it back to it's former glory is still widely available today from mainstream electronic component suppliers and eBay is awash with all manner of exotic parts for enhancing them beyond their original spec as well as a vast supply of vintage valves if you want to keep it original. Guess it had to happen - one of mine suddenly started humming / buzzing one day. After some quick checks (the schematic has all the voltages on it and by quickly measuring them the fault was found almost immediately), it turned out that it wasn't a valve, but an electrolytic cap to blame. Electrolytic caps are prone to problems since they contain a liquid electrolyte. If they are not perfectly sealed, the rubber seals crack and perish with time, or are simply slightly porous, the electrolyte dries out and they eventually fail. It was a power supply filter cap so completely understandable that it would hum like crazy without it. I was very surprised when I powered it back up - the amp I had just replaced the caps in was much cleaner sounding and an extraordinary clarity that the other one lacked. I hadn't used any exotic components - these where just standard cheap mass produced caps. It wasn't long before I replaced the caps in the other amp. While running original components is great from the point of view of preserving history, when it comes to sound quality, old electrolytic caps are clearly letting the show down. This may also be a contributing factor why the original TL12 "Point One" is considered superiour to the later one. The original had a choke filtered power supply with a paper power supply cap. The all electrolytic line up on these later TL12s is probably really letting them down now when compared to the originals. I recently bought a pair of 12+ and is looking for service manual for this power amp.I tried to find in google but it seems only schematic is available.So would you please let me know if you have service manual on hand. No luck I'm afraid - everything I have done with these is a combination of little bits of info found scattered around the web and my own experience of electronics. Beware that there are different versions of the amp which have different output transformers and some different component values, so you must find info for the particular version you have. Hi Glen, I have a pair of TL12+ amps refurbed, was wondering what 'exotic passive preamp' you are using as this seems a way forward to get more from the amps? Nothing exotic at all - an aluminium case with an input selector and a 10kA pot. The thing you need to watch for is the resistance of the pot forming a low-pass filter with the capacitance of the cables. In my case I use low capacitance cables and the pot is generally at the low end so source resistance is probably around 1-2k which I think is acceptable for me.